If you haven’t seen the incredible film Hidden Figures yet, what exactly are you waiting for this? It’s a must-see movie that brings to light essential black female historical figures who have, for all too long, been pushed under the radar. Quite frankly, I’m ashamed to say that before the movie came out, I had no idea of their incredible story – but it’s one I won’t forget anytime soon now. I kept meaning to see the film in theaters, but just never got a chance. I was going to place a hold on a DVD copy at the library, but there were a whopping 77 (!) people ahead of me on the list. Luckily, I discovered I could rent it on iTunes and finally, with a day off last week, sat down and watched it. And wow! 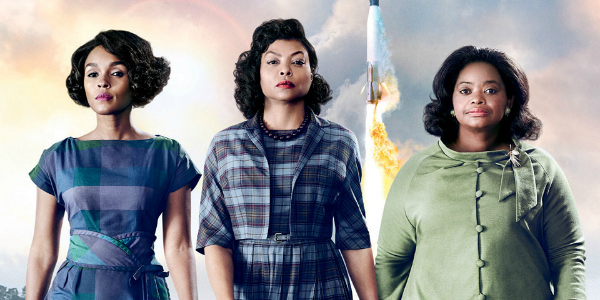 Hidden Figures tells the story of three African-American female mathematicians who worked at NASA. Those women: Katherine Johnson, who calculated flight trajectories for Project Mercury and several other missions; Dorothy Vaughan and Mary Jackson. The film is incredible, but the story is what matters the most. Katherine Johnson conducted important technical work at NASA, including her time in the Guidance and Control Division of Langley’s Flight Research Division. All the while, as she was working on these important tasks, she dealt with segregation and discrimination at a number of levels. She became an aerospace technologist, calculating trajectories for missions including Alan Shepard, John Glenn and Apollo 11 and Apollo 13. Johnson was awarded the Presidential Medal of Freedom in 2015 and has received a number of other honors as well. Today, she is 98 years young. Here is her biography at NASA. Mary Jackson became NASA’s first black female engineer in 1958, after already having worked for the company for years at Langley Research Center. A mathematician and aerospace engineer, she too fought segregation and discrimination. Jackson earned degrees in mathematics and physical science from Hampton Institute in 1942, and later petitioned the city of Hampton to allow to attend night classes at the University of Virginia. Her work at NASA eventually led her back to Langley, where she served as the Federal Women’s Program Manager and the Affirmative Action Program Manager. She retired in 1998 and passed away in 2005 at the age of 83. Here is her NASA biography. Dorothy Vaughan became the first African-American woman to supervise a staff at the Langley Research Center. She worked tirelessly in her position as a mathematician and human computer, and taught herself & her staff the FORTRAN programming language. This led her to the eventual position of heading the programming section of the Analysis and Computation Division at Langley. Their work expanded, and again, over the years Vaughan also dealt with racial segregation and discrimination. She retired from NASA in 1971, after 28 years,, and passed away in 2008 at the age of 98. Her NASA biography is here. Again – if you have not seen this film, you must. I also plan on picking up the book on which the film is based and reading that soon! Also consider reading this article from Popular Mechanics and this one from The Atlantic, both of which are essentially reviews of the film but provide good context!